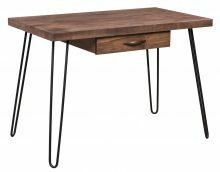 Do you need a sturdy, stylish desk for a home or company office, study or a kids’ bedroom or dorm room? You’re sure to find exactly what you’re looking for when you peruse our extensive selection of handcrafted Amish Solid Wood Desks. Are you tired of dealing with the clutter in your office? Our wide assortment of solid wood Amish desks can give you plenty of room for your computer equipment, files, books and office supplies, while also providing a significant style upgrade to your office. Our collection includes well over 200 desks of all types and sizes, making it easy to find the perfect desk for your working style and space requirements. You’ll also find pieces designed for kids’ bedrooms and college dorm rooms. A heavily used desk must be tough enough to handle the challenge of daily activity. Our desks are made from your choice of sturdy, durable northern kiln-dried hardwoods such as oak, cherry, maple and hickory – materials known for their ability to last and retain their natural beauty over time. With the unparalleled Amish craftsmanship that goes into every piece, you can be sure your desk will remain the centerpiece in your office for years to come. Do you have a lot of files to store in your desk? If so, then a corner desk with extra storage along the side might be the best fit. Is the color scheme in the room light or dark? You should make sure the new piece will complement the color of the room. If you have a dark room, a light desk may provide an appealing contrast. Would you like to close off your desk when you’re finished working? Then a computer armoire from our collection would be a smart choice. Is your room small? We make desks you can install in a small room without sucking up all the excess space. Look for skinny flat wall or one-level corner options. Does your office need new desks? Have you been searching for ones that combine sturdy construction with longevity? Are you eager to bring a more polished look to your office space to impress prospective clients? Then you should buy your new desks from AmishOutletStore.com. Our exceptional selection includes many desks perfect for B2B or B2C companies. We have big, small and medium desks to fit any size office. With our customization options, you can match the existing decor in your office. You can order many of the same desks, or you may opt to let your employees select their own. This will give them a sense of ownership and appreciation for your investment. We can also provide bulk buying options if you need to purchase a great number of desks. We sell other office furniture, too, for those looking to keep the solid wood style of the desks flowing through the entire office. Our many attractive options include chairs, bookcases, printer stands and more. Your employees will love sitting down at their new desks and will enjoy the new opportunities for storage space and spreading out their frames and personal effects. Make your business look even better with our desks. We often speak with customers who say they’ve fallen in love with one of our desks, but they’re worried it won’t fit with their existing décor. Luckily, that décor is easy to change. With a few tweaks, you can bring home a beautiful new Amish desk that will fit right into the room. Accessories such as frames, vases of flowers and table runners can help pull together a room. Place these things not just on the new furniture, but also on the old, to create a cohesive identity. 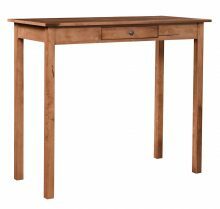 Amish solid wood desks have a distinctive wood grain that’s part of their appeal. 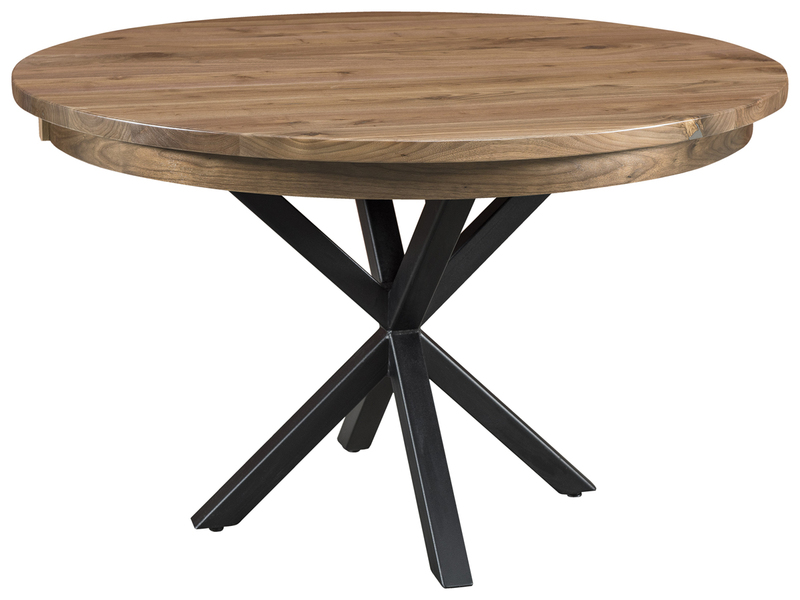 Echo that grain with wood furniture or frames that have the same pattern. For instance, you might find a stain that matches the new desk that you can use to paint an old frame or see a piece in the same shade at the neighborhood yard sale. Chances are you have old furniture in your basement or attic that’s not being used. Bring a piece into the room to freshen the look around your new desk. When you buy a new desk, you want something that will resist wear and tear. After all, you use your computer every day. You’ll be sitting at the desk frequently, and the rest of your family will be using it, too. We make our furniture with this high intensity in mind. Our desks are crafted for heavy usage. They have been designed to last a long time, so you can think of our furniture as an investment. High-quality Amish furniture doesn’t have to come with a high price tag. With our wide variety of money-saving discounts, our Amish desks can fit even the tightest budgets. Order any desk right now and get up to 33 percent off the regular retail price! Additional discounts are also available for large orders and for paying by check. Browse our extensive selection of expertly handcrafted Amish Desks and order the perfect one for your office today!